Our APIs power the residential energy module in the Cool California carbon calculator, created by the California Air Resources Board. Actions you can take to improve energy efficiency, reduce your fuel usage, recycle, conserve water, buy green, save money, etc. Rebates, grants, and financial incentives offered by local utilities, state programs, and private institutions. Tools to measure your carbon footprint and how to take action to reduce greenhouse gas emissions. Case studies that describe actions taken by others, their cost savings, and emission reductions. Educational resources, sustainable business programs, on line communities, social networking sites, and much, much more. CoolCalifornia's partner organizations seek to empower Californians to improve the State's future and protect its environment. 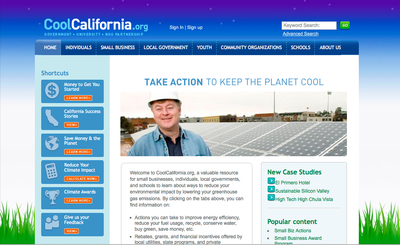 CoolCalifornia.org is THE new one-stop-shop for all Californians – packed with quick, easy-to-use and reliable tools that all Californians need to save money and reduce their impact on the climate.